Welcome to the 2nd part of our Ireland trilogy and unlike George Lucas I will stick to just 3 episodes. 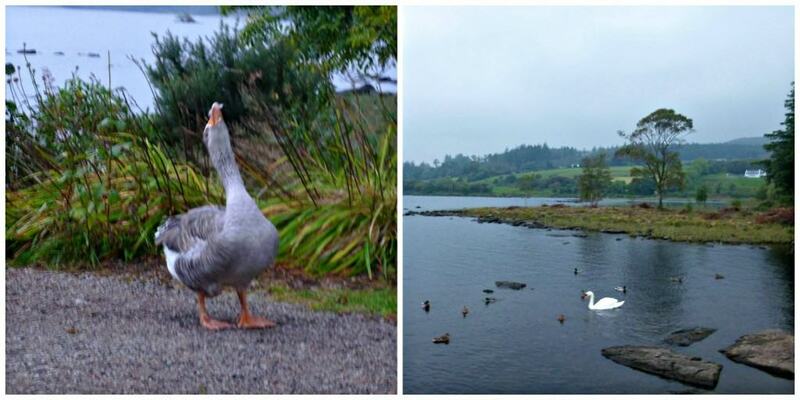 If you read my previous post on Sligo, you will know it would have to be something special to top my experience there. Well Donegal certainly started with a bang. Our very first activity after driving along the wild atlantic way was to go out on a boat to see the iconic Sliabh Liag cliffs. On our itinerary it said that the boat trip was weather dependent. Thankfully the weather was beautiful which you don’t get to say very often in Ireland!. Our boat trip was with Slieve League Boat Trips. Paddy our skipper has over 20 years experience in commercial fishing, leisure angling and in the offshore wind farm industry. 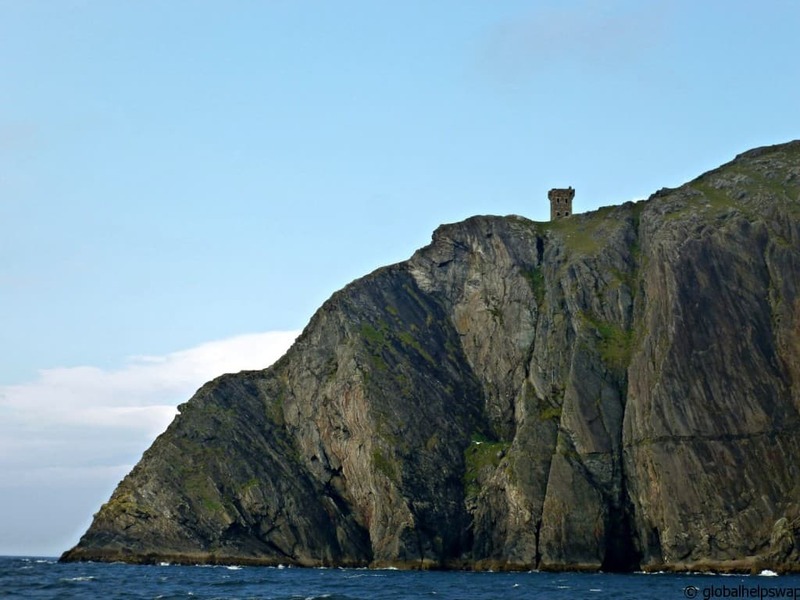 The Sliabh Liag cliffs are the highest sea cliffs in Europe standing at 600 m (1,972 feet). They are a spectacular sight especially from sea level. It felt great to be on the ocean again. The water is crystal clear around the cliffs so much so that some of the bloggers decided they were going to swim once we reached the cove. As I was deliberating braving the cold atlantic, somebody shouted DOLPHINS!! Wow, wow, wow. 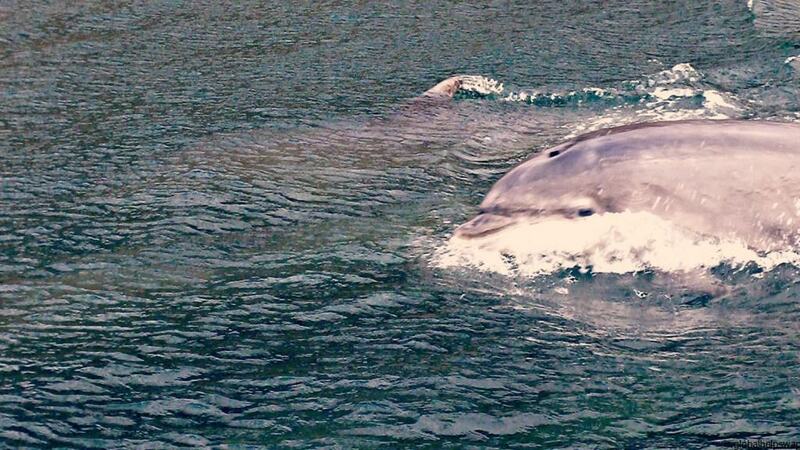 I have been around dolphins before but not as close as this and not for this amount of time. 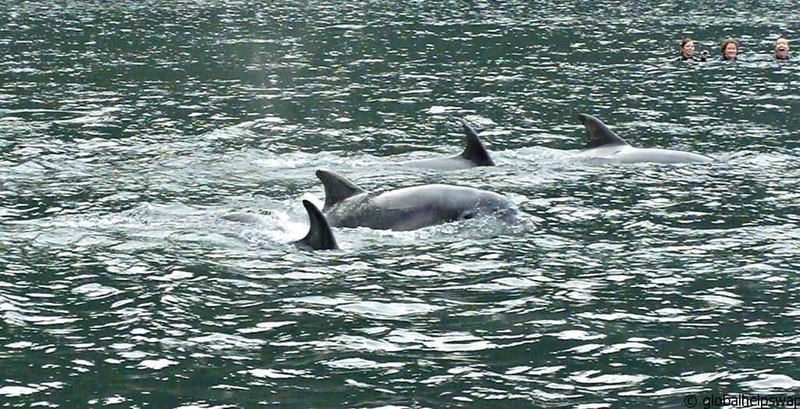 At some points they were so close to us you could hear them communicating. I am sure they could hear our excitement as they kept on doing more elaborate jumps. Sadly I was way too excited to capture their jumps. These gorgeous creatures stayed with our boats for at least an hour. In fact they never left, it was us that had to leave as we had to carry on with our itinerary. Failte Ireland were really impressing us by now. Dolphins on a Monday morning, it does not get better than that. After all that hard work running around the boat trying to capture dolphins we were all famished. Luckily lunch was waiting for us at the wonderful Ti Linn Artisan Cafe where we were served some delicious home baked scones with caramelised onion & sundried tomato and a lovely warming soup that left our taste buds tingling. Yum! After lunch it was time to see the Sliabh Liag cliffs from a different perspective: on top of them. The drive up to them is very dramatic, it truly felt like the wild atlantic way. Standing at the viewing point you get amazing views. On clear days you can see across Donegal Bay to counties Letrim, Sligo and Mayo. Below us was the wild atlantic where we were in the morning. I vowed to return to this place as I really wanted to explore more of the area. In the afternoon we visited Glencolumcille Folk Village where more tea and cake was waiting for us! I am quite sure that I have put on a lot of weight during my stay in Ireland with all this wonderful hospitality. 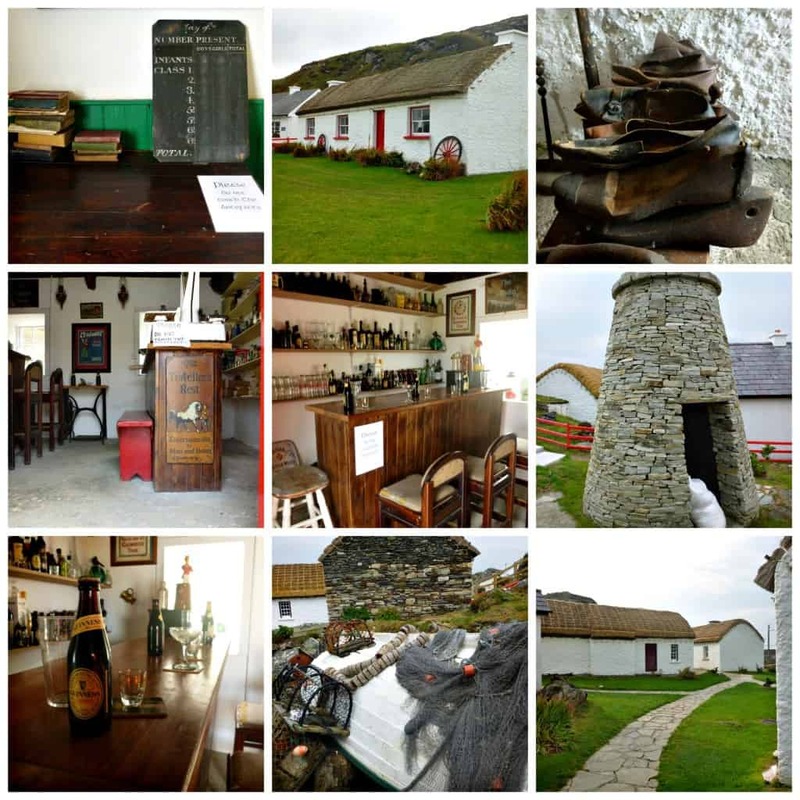 The Folk Village Museum was the initiative of a dynamic Donegal priest, Father James McDyer. It opened in 1967 with three cottages, built and furnished in just three months through local community effort. It’s a great place to witness how people lived in this part of Ireland. Just before we headed off to our abode for the night we had one last visit to make. School! We had an hour of Gaelic lessons at the world-renowned Oideas Gael Cultural Centre. When you see Irish written down it looks like a language that would be difficult to pick up but surprisingly it was not that hard at all. Or maybe it was the fantastic teacher we had in Siobhan. Meet Jody, Marc and Deirdre. Together they run the amazing Harveys Point hotel. 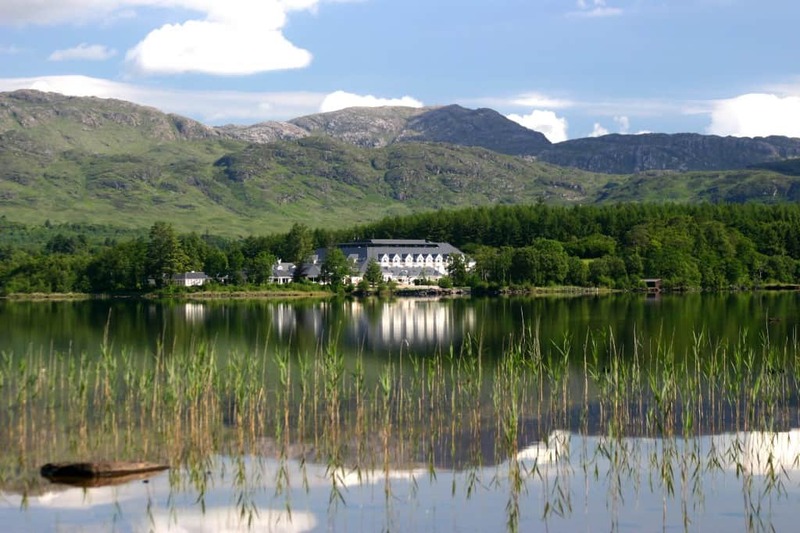 Hidden in the hills of Donegal, Harvey’s Point is a beautiful hotel set right on a stunning lake. I don’t normally write about top end hotels but Harvey’s Point is a little different. It is a family run place that originally started out as a 4 room guesthouse in 1989. Slowly through the years they have added to the hotel to make it what it is now. Deirdre originally started work in the hotel on a temporary basis. That is until she met Marc. 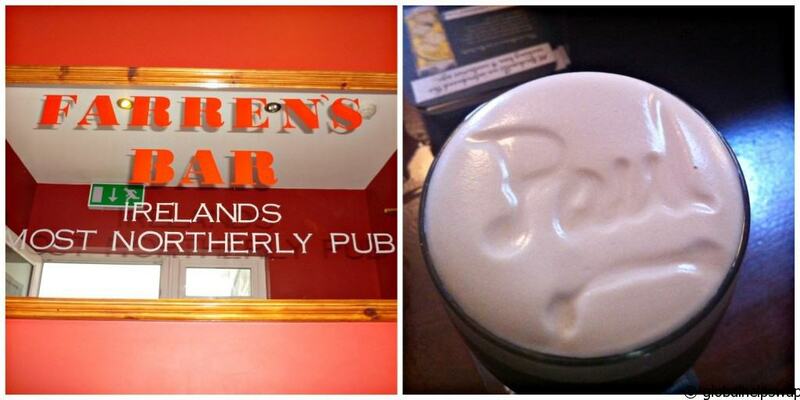 They soon fell in love and Deirdre never left! I have never experienced a warmer welcome in a hotel. Speaking to other guests, I knew it was not just for us bloggers. Deirdre is the most wonderful host. If you are ever in Donegal, please stay at Harvey’s point even if it’s just for one night. It’s an experience not to be missed. The following morning we headed to Inishowen Peninsula which is the largest peninsula in Ireland. Once an island itself, it now enjoys a unique location between two sea lakes and the wild Atlantic. Our first stop was at the Grianan of Aileach Ancient Stone Fort (1700 BC). It is set 800 feet above sea level with amazing views of Lough Foyle and Lough Swilly. Nobody is sure why it was originally built but eventually it has been identified as the seat of the Kingdom of Aileach and one of the royal sites of Gaelic Ireland. 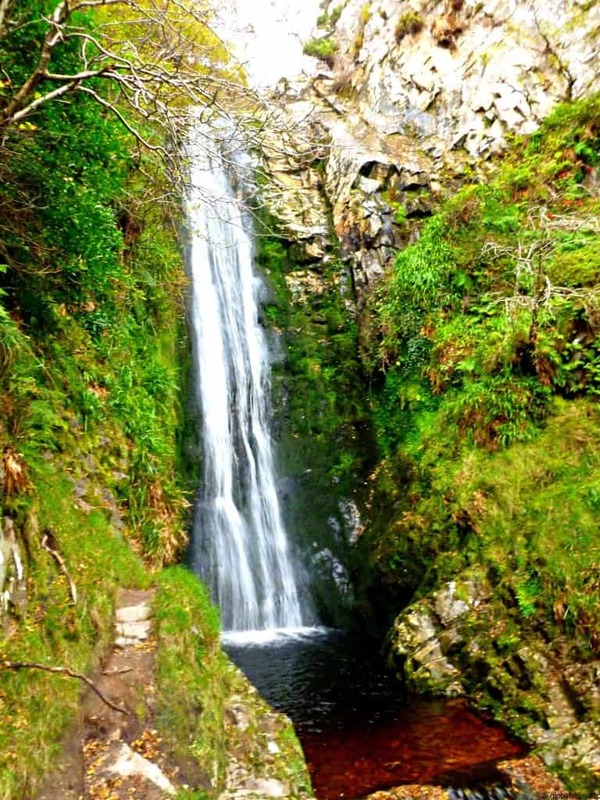 In the 2 days we spent in Donegal one of my favourite spots is the Glenevin Waterfall, in Clonmany. It’s a beautiful little walk to the waterfall with lots of areas where you can stop and have a picnic. 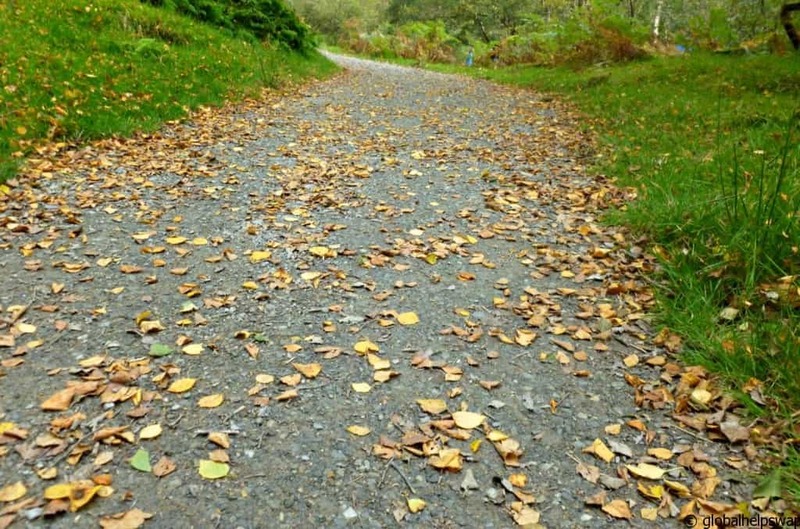 Once again the weather was on our side as the sun was shining on all the autumnal colours of the trees and vegetation. It is really beautiful. 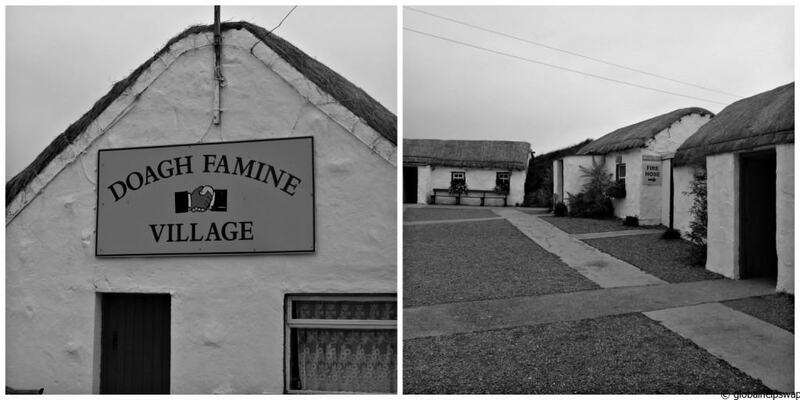 After lunch we went (ironically) to the Doagh Famine Village. The tour is an informative, thought-provoking and at times humorous look at Irish life. The Famine Village is an outdoor museum that tells the story of life in the area from the Famine back in the 1840s, through the 1900s to the present day. It’s called a famine village but they cover a lot more subjects than just the famine. From ancient history to the troubles in Northern Ireland it is all covered here. My favourite part was discovering the “secret” rooms in the mock houses. Our final destination for the day was at Malin Head, Ireland’s most Northerly Point. Next stop would be either Canada or the United States. Malin Head is a historical place. It is the place visited by the ancient Celts, the Vikings, Columkille and many others over the centuries. It was the last place seen by Irish people as they left for America. Their friends and relations stood on Banba’s Crown and waved goodbye to their ship, sailing westward. Which is pretty poignant as there were a few Canadian bloggers with us with Irish ancestors. Needless to say the views were amazing. Apparently it is Ireland’s sunniest place. I would also say it’s windiest! 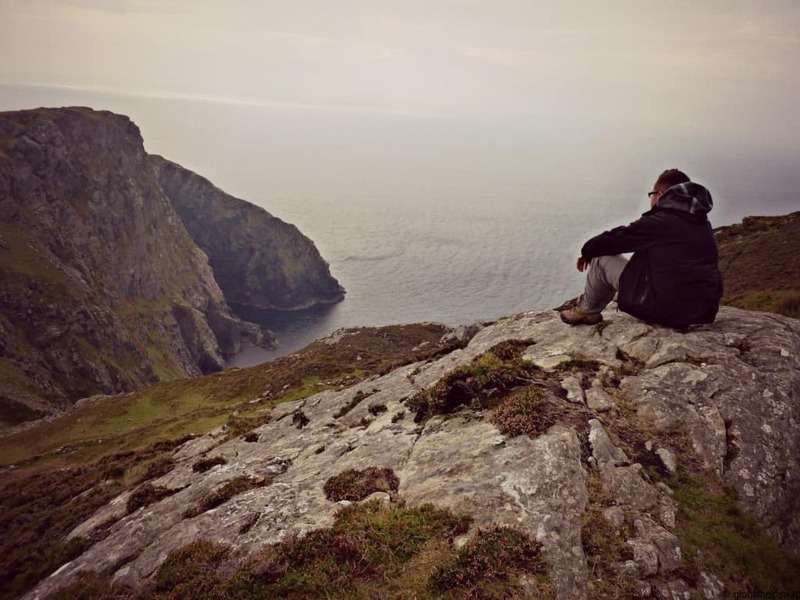 Standing on the edge of the cliffs and looking out at the Atlantic, you can’t help but try to imagine what it was like for the people sailing to the new world to start their new life. It must have been very exciting and frightening at the same time. We ended the day and our wonderful tour of Donegal at Ubiquitous Restaurant, where they served us a delicious dinner of baked goats cheese to start and huge Irish steaks as our main. It was delicious and I highly recommend a visit. We lay our weary heads at the lovely Ballyliffin Lodge which is a family run hotel that started in 2005. Donegal truly felt like I was on the wild atlantic way. 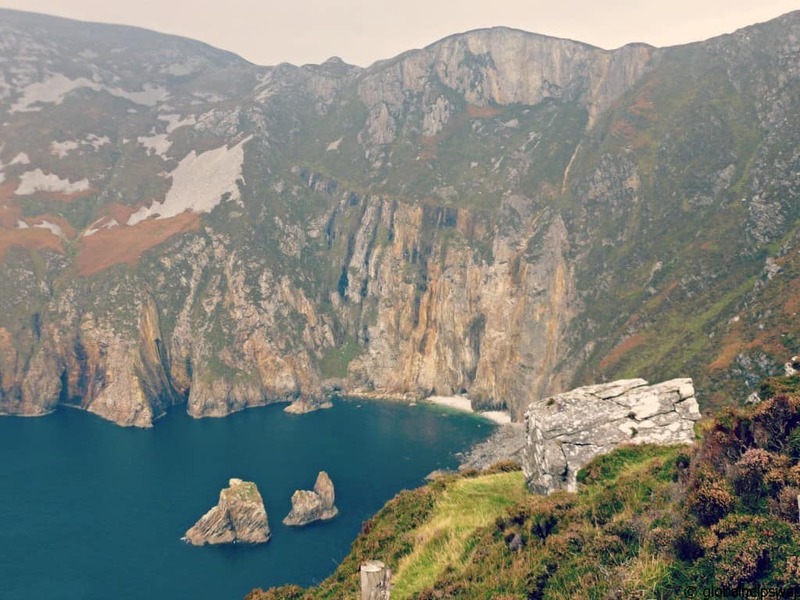 With remote villages and rugged sea cliffs, Donegal IS the end of Western Europe. What will stay with me is its natural beauty and wildlife. From the playful dolphins to the wild flowers all along the lanes. It was so refreshing to be in an area where man has not overly imposed himself. If you want some quiet time away from the hustle and bustle of modern life, Donegal is the place to go. Once again I would like to thank Failte Ireland & Tourism Ireland for a brilliant itinerary. A massive thank you to Letty Cronin for all the organisation. Special shout out to Josephine O’Keefe our brilliant guide throughout the whole trip, what she does not know about Ireland can fit on a postage stamp! I would also like to thank my fellow travel bloggers who made this trip so memorable (I will introduce them in due course), and to everybody at TBEX. Without you guys none of the above would have happened! Last but not least a big THANK YOU to the infamous Irish weather for being amazing during our 5 days in Sligo and Donegal. Disclaimer: We were guests of Failte Ireland & Ireland Tourism. All opinions are my own. rated us a top travel website! 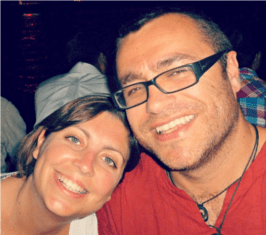 globalhelpswap is no ordinary travel blog. Our aim is to get more people to volunteer when they travel. 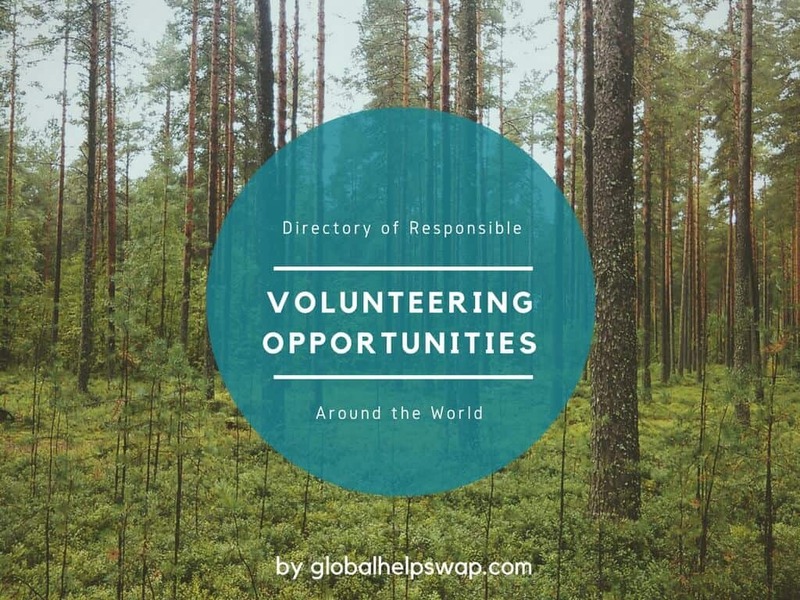 We have a database of over a 120 free or low cost volunteering opportunities all around the world and unlike other organisations we do not charge a penny. Wow Fantastic the dolphins and the read was just amazing ,keep up the good work . Oh, I loved reading this recap of our time in Ireland. Wow, we did a lot! So many wonderful experiences! I second the thank yous for the amazing weather we had! 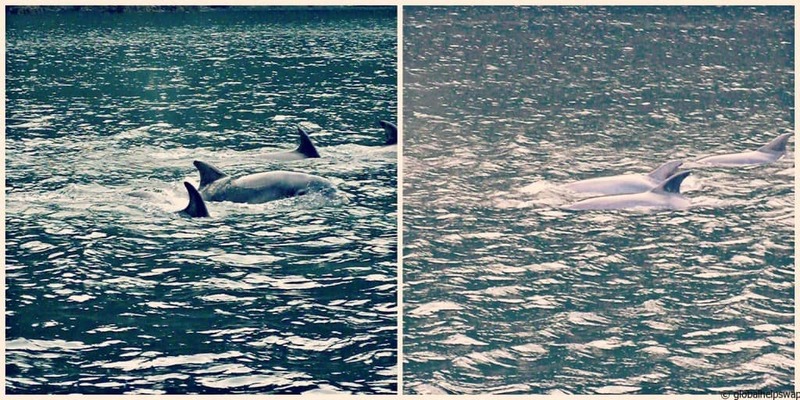 Great shots of the dolphins, Paul! Thanks Mom and Alison!! I know, I still can’t get over how lucky we were with the weather! 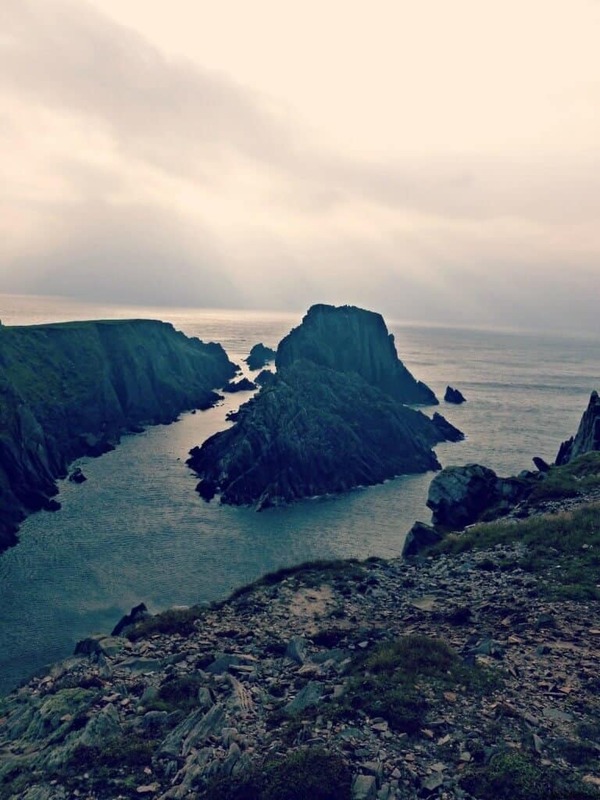 Great reading your blog here in Donegal, knowing that all of this is on our doorstep for us to enjoy. 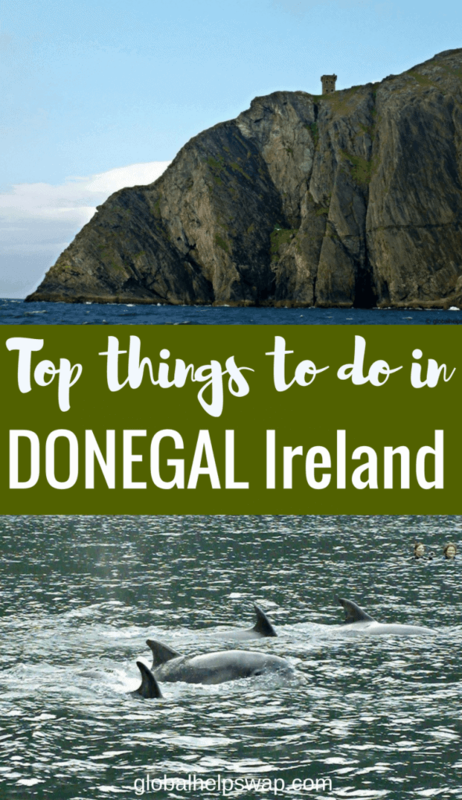 There are many more fantastic sights in Donegal that are really not on the tourist map. Thanks for visiting our beautiful county of Donegal. Oh my gosh, we DID do so much! It’s funny seeing it all written out there, one thing after the other. It’s no wonder my head is still spinning when I think about that trip! Thanks for sharing it all, and for reminding me what a wonderful time we had together! My wife Joy’s Great Grandfather William McGinty married Victoria McKeon in Donegal County and they came to the US in 1861. All posted in the family bible. I cannot imagine how great a trip like this would be especially for her. Thank you for the article. I am going to copy it for her and take it home. Hi Jim, Thank you so much for your comment. This is the reason why we love to write, to give people the chance to travel even if its in the mind. Take care. Fantastic article. well written and engaging. loved every bit of it and what you are doing. I had Just subscribed to your blog and site when i came upon what work you do professionally. Hi Casey! Glad to have you on board and thanks for the lovely comments! This is an enlightening read for me. As a wildlife tour operator, I very well know, that you can’t be closer to the ground truths.